Recently I added HF APRS to my mobile, and after a week of using one of my gearmotor antennas on the high end of 30 meters where HF APRS is located, I realized that I needed a dedicated 30 meter coil expressly for this mode, so as not to tie up my gearmotor antenna. So here is the finished 30 meter coil that I designed and built in my shop for HF APRS located on the high end of the 30 meter band. The coliform is built from 3 pieces of Delrin that I turned to shape in the lathe, that being the main Delrin coliform tube section with the two Delrin endcaps. I wound the coilform with 14 gauge wire with 8 tpi spacing that I cut in the lathe. 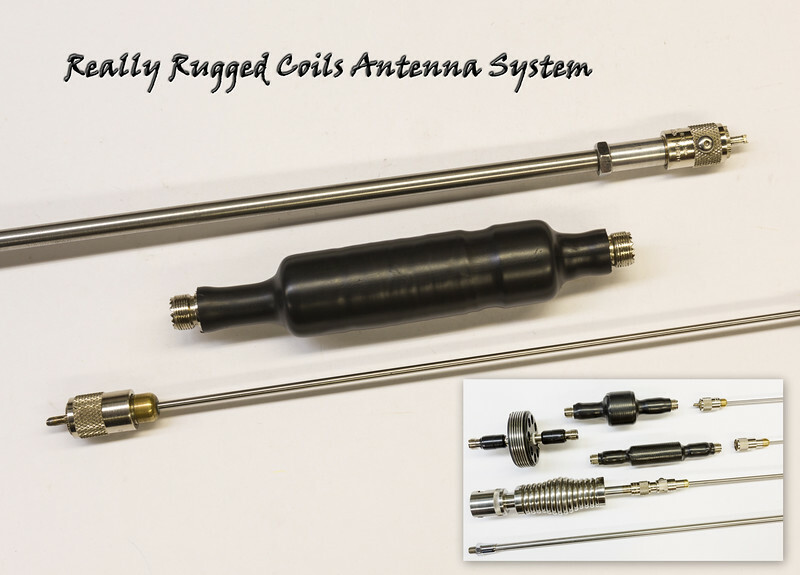 The threaded ends allow for mounting in my existing really rugged antenna system that is based on PL-259 connectors as seen in the photo. Since initially utilizing female ended jacks at either end of my earlier built coils, I now discard the inside insulators of the jacks and machine solid stainless steel inserts as replacements. In one of my antennas as seen here, the complete coupler is conductive and no insulator is required. The center pin of the PL-259 connector allows for easy alignment when changing out coils. This modification is part of what adds to the ruggedness of one of my coils. The coil is covered with adhesive lined 3-1 shrink-tube to keep the weather out. I am very pleased with how it performs since placing it in to service on the HF APRS segment of the 30 meter band. All the coils pictured including my new 30 meter coil are part of my RRC (Really Rugged Coils) antenna system, and utilize the same 60 inch whip with any of the coils mounted in place on my mobile. My RRC antenna system was designed to be driven with 500 watts out regardless of what band coil is mounted in place. The coils may be changed out by hand, no tools required.